The holidays are over now and I'm wiping my brow in relief that I didn't have to call a plumber once between Thanksgiving and New Year's! I usually don't get through that period without the kitchen sink backing up. But one of 2008's most popular new inventions, not to mention one of Pop Sci's Best of What's New, PermaFlow, tells me that I may not even have to call a plumber if the sink or toilet backs up. 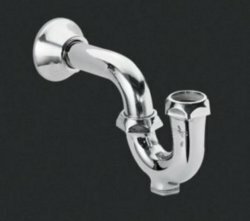 P-Trap Drainage problems in both sinks and toilets are usually related to the part of your plumbing fixture called a "p-trap." That's the section of pipe that's shaped, not like a "p," but like a "u." If you have semi-solid or very viscous material in your fixture's pipes, you might use a toxic solvent to try to dissolve it, and then pray... After that, you call a plumber. Usually, the plumber will either fish the gunk out of the P-trap with a plumber's snake, or take the P-trap off and clean or replace it... if the problem is the P-trap. You won't even need a plumber to install the PermaFlow. 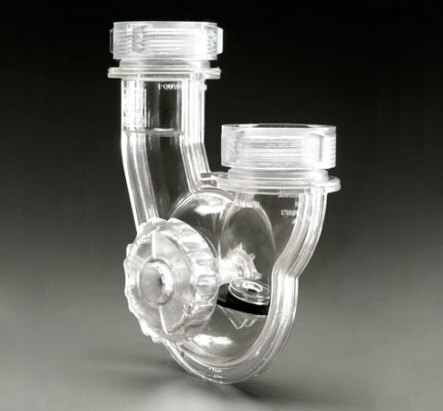 It's a see-through, self cleansing P-trap that contains a mechanism to cause more turbulence in the pipe, so less gunk gets stuck. If the drain does happen to get backed up, you can spot the problem yourself. (Just your luck, huh?) Then you just turn the knob of the PermaFlow around until a bypass is created for the gunk to move. 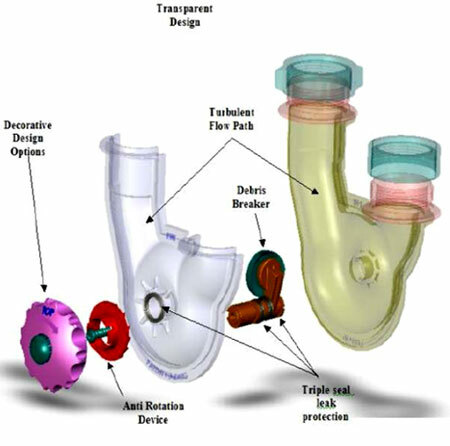 Here's how the patented PermaFlow is put together, although the casing is clear. Made of ABS, probably the sturdiest plastic in industrial use, the PermaFlow's efficiency has been tested up to 31,000 rotations. The trap is even designed to catch jewelry or other items that may slip down the drain. The PermaFlow sure saves the environment from the toxic liquid drain cleaners being poured into it. And it's likely to save you a few bucks in plumber's bills.